An MSF surgical team cleans a man's wound after they removed a bullet from his arm in Bangolo Hospital in western Ivory Coast. The peaceful atmosphere in Bangolo Hospital is an astonishing contrast for most of the patients currently receiving care here. Just a few days ago, many of them suffered terrible wounds in violent attacks in the Duékoué area of western Ivory Coast. Today, they are recovering from surgery or waiting to receive it. 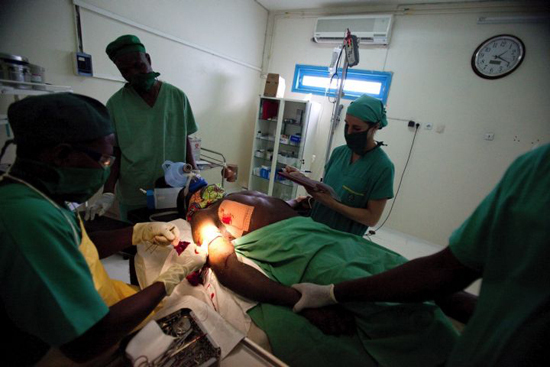 In the operating theater, a song emanates from nurse Olga Oulaï’s surgical mask as she hands tools to Doctors Without Borders/Médecins Sans Frontières (MSF) surgeon Martial Ledecq. Unlike many health staff in the region, Oulaï did not flee the violence. In addition to her invaluable work, her singing is a welcome boost for the rest of the team. Since a spike in violence hit the Duékoué area two weeks ago, the MSF surgical team has been treating 180 people with wounds caused by guns, hunting rifles, or machetes. With most surgeons having left the area, the workload for those remaining is huge. The arrival of the MSF surgical team at Bangolo Hospital was much needed; there was only one local surgeon who had remained. Across the entire western part of the country, just a handful of health structures continue to function. This patient’s infection had gotten worse while he hid in the bush for days before making his way to the hospital. After the initial influx of patients between March 28 and April 1, there has remained a constant stream of new wounded patients who have been hiding. Their injuries are often infected or have worsened because of the distance they have had to walk and the number of days spent without appropriate treatment. Just a few kilometers away from where massive violence was unleashed days ago, people from all communities—military and civilian—are sharing the same wards, recovering from often terrible injuries. The conflict never crosses the entrance of the hospital. As Dr. Ledecq does his rounds between operations, he spends some time with each patient. He knows their names and the status of each of their treatments. The pages of his notebook are quickly filled as he schedules operations for the following days, prioritizing the most urgent cases. In the green zone, where the least urgent cases are staying, he has to tell patients they will need to wait a bit longer. Four sisters, one of them five years old, will have to wait a few more days before they get the small rifle bullets removed from their legs and hips. A wink and joke later, he even manages to get smiles out of them. Sitting on the floor next to the sisters is a little girl whose foot had to be amputated after bullets from a gun damaged it beyond repair. “Having to amputate always feels like failure; it means everything else failed and it’s basically a last-resort option,” Dr. Ledecq says. A few rooms down a woman whose hand Dr. Ledecq amputated is recovering. When doctor and patient made the decision together, she asked him, “if you make my arm shorter, will it make my life shorter?” to which he said “no”. She then told him to go ahead as she needed to live long for the sake of her children. The next step in these people’s lives remains unknown. Some are too scared to go back to their villages; some have had their homes burned or looted. Most will be bringing home visible and often permanent scars of the recent violence. The invisible ones will certainly stay with them just as long. Following the post-election violence in Ivory Coast, MSF has been providing people with primary and secondary healthcare assistance by organizing mobile clinics and supporting health centers and hospitals in several locations in the western part of the country and in Abidjan. MSF teams are also assisting refugees and local populations on the other side of the border in neighboring Liberia. Currently, MSF has 50 international staff working together with 150 Ivorian staff in Ivory Coast. In Liberia, there are 10 international staff working with 30 Liberian staff. MSF, an impartial medical humanitarian organization, observes strict neutrality in its operations. Its activities in Ivory Coast are funded exclusively by private donors, ensuring the organization’s complete independence.